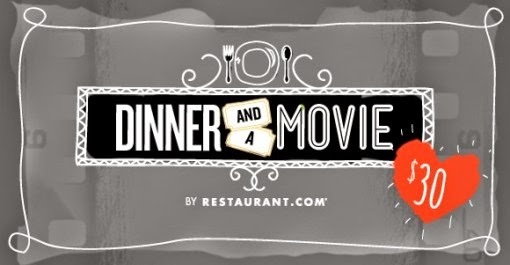 Thanks, Mail Carrier | Take Advantage of a Great Deal on Dinner and a Movie for Valentine's Day from Specials by Restaurant.com! Take Advantage of a Great Deal on Dinner and a Movie for Valentine's Day from Specials by Restaurant.com! With Valentine's Day right around the corner, it's time to put the final touches on your plans while also keeping an eye on your wallet. Whether you're celebrating with loved ones or just looking for a night out, does the whole evening have to add up to spending big, big bucks? If you're still in the mindset that it does, then you haven't checked out Specials by Restaurant.com! While you surely know that Restaurant.com offers gift certificates providing a savings at tens of thousands of restaurants with a seemingly endless number of daily printable options, did you know that Specials by Restaurant.com has a wide variety of package deals that can save you even more? Perfect for Valentine's Day, they just launched a special today that includes two movie tickets and a $100 Restaurant.com eGift Card... for only $30! Yes, you read that right! With this exclusive Specials by Restaurant.com deal, you'll receive two movie tickets to use at one of your favorite movie theaters (find your local theater here), along with a $100 Restaurant.com eGift Card all for just $30... which is an unbeatable 76% savings! You'll love the great deal of movie choices ranging from hot titles such as The Seventh Son, In the Heart of the Sea or Jupiter Ascending, fun kids' options like SpongeBob: Sponge Out of Water, or the saucy and spicy, much-anticipated Fifty Shades of Grey. It really doesn't matter if you're spending Valentine's Day with your husband, wife, family or friends, Specials by Restaurant.com Dinner & a Movie is the perfect way to say "I e-love you!" Don't miss out on this exclusive offer (it is for a limited time only, while supplies last) for a great way to spread the love without breaking the bank! Restaurant.com and Specials by Restaurant.com offers make great gift ideas for everyone, so be sure to visit their website to find out more about their gift cards as well as to find participating restaurants near you. You'll also want to connect with them on Facebook, Twitter, Google+ and their blog so that you never miss their next great deal. This is an incredible deal. I need to get in on this for $30 dollars I can get a lot of meals at the restaurant. Thanks for sharing! Sounds like an incredible deal! That is a great cheap idea for Valentines day! This is a great deal. Thanks for letting me know about it. Didn't do it for Valentines. Perhaps next month. What a bargain! Great deal.